When you think about the necessity of water in agriculture, fruit trees, row crops, and cattle probably come to mind, but you might not think about bees. As if honeybees and beekeepers didn’t have it hard enough these days, they face another challenge: drought. “Normally at this time of year, I have honey coming out of my ears,” says Spencer Marshall of Marshall’s Farm Natural Honey, who has about 80 apiaries in the Bay Area and beyond. In recent years, the Marshalls have been noticing a steady decline in their honey production as local nectar sources dry up. Honey is made from flower nectar, processed in the “honey stomach” of a bee and evaporated in the hive until the sugar concentration reaches about 80%. So when nectar is scarce, so is honey. While many large-scale beekeepers place their hives amidst irrigated commercial crops like nut and fruit trees, the Marshalls’ bees also depend on nectar from wild plants like eucalyptus, acacia, star thistle, and coastal sage. Drought and nectar scarcity are just a couple of the many perils that honeybees and other pollinators have to contend with. Bees are a critical part of our food system, pollinating about one third of our food crops, amounting to about $15 billion in crop value per year. Certain crops like almonds would not bear fruit without the help of bees. Honeybees have been in decline over the last couple decades, as the threats of Varroa mite (a deadly parasite), colony collapse disorder (a little-understood phenomenon in which colonies mysteriously disappear), and the use of toxic pesticides have increased. 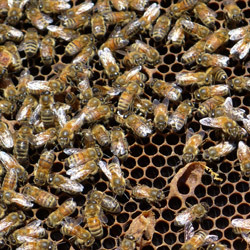 Over the last decade, beekeepers have reported losses of 30 to 90 percent of their hives. Winter is an especially vulnerable time for bees, when nectar is in low supply and bees must stay close to the hive to conserve heat. The Marshalls estimate they lost 60 to 70% of their bees this winter, compared to as little as 20% in previous years. Local beekeepers rely on plants like eucalyptus to supply food for their bees in the winter, but the lack of rain last fall left the trees with hardly any blossoms. With a dearth of nectar, and thus little honey to nourish the hive, eekeepers must sustain their colonies by feeding them sugar water. “It’s something you don’t want to do, but you also don’t want to let them die,” says Helene. Bill (pictured above) and Ann Snyders of Snyders Honey also rely on wildflower blooms to feed their bees. They used to get two honey harvests per year, one in the spring and one in the summer, but recent dry spells have meant that the supply has dwindled down to a single harvest. As a result, they are also rationing their honey supply at the farmers market to make sure it carries them through the season. Continual drought also means that there are fewer seeds in the ground to sprout and bloom each spring. “If the conditions aren’t right, the flowers sense it and don’t reproduce,” says Spencer. “If the seeds aren’t in the ground, we won’t get new plants even if there’s water.” When there’s enough rain for the flowers to put out seed, he estimates, it still takes three or four years for the plants to come back. At Devoto Gardens & Orchards in Sebastopol, the Devotos welcome the much-needed rain, but they are worried about getting too much all at once during this precarious time in the orchard, when their apple trees are blossoming. You can find Marshall’s Farm Natural Honey at the Ferry Plaza Farmers Market on Saturdays and Thursdays, and Snyders Honey at the market every other Tuesday. Photos of Snyders Honey by Denise Tarantino.